We’ve gotten all the colonies in place. No place like home. On the 12th and 18th of April, we hived 8 packages. Two weeks ago, on May the 10th, we picked up two nucleus hives, or “Nucs” for short. A nuc consists of 5 full frames, with a queen, a full complement of workers, and cells full of honey and brood in various stages of development. These bees have all been working together for at least a couple of months, in fact they may have helped pollinate the almond groves in California this past month or so. (They’re also about 40% more expensive than a package).Now… Sarah Rushfeldt in Dresser, Wisc, has been working with honey bees since 1996, and has grown her business to 100’s of hives. Not bad for a 25 yr-old college kid! My friend Tom and I took the 80 mile drive up to Dresser (thank goodness for GPS), and found Sarah out in the field with about 500 hives, with another 500 expected that afternoon. Once we saw what 500 hives looked like, we decided that Tom should have worn something other than shorts. He stayed in the car and took a few pictures of the field, while I picked up the nuc boxes, got them into the trunk, and then we were on our way home. Part of 500 hives just back from almonds. 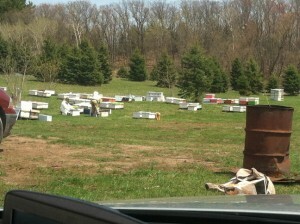 Just a little later in the afternoon, Cindy and I took the nucs out to hives at Zweber and Sanders Farms bee yards. The rain was coming in fast, so I had to move fast. And man, these girls were ticked off. They had just been trucked from California, pulled out of their traveling box, and thrown into a smaller nuc box, and then dropped into a new hive under cloudy, rainy skies. You’d be cranky too. (I only got two stings with all this brouhaha. My left index finger looked like a knackwurst suasage for a couple of days ;). So our colonies are all set for the season! I’ll have an update later this week with the final locations for your personalized hives, boxes and frames and a report on how all the colonies are looking. (11 out of 12 colonies are looking pretty darn good). Spring is finally here, and we’re excited for the honey bees to get down to work (dandelions are just starting to bloom, which means nectar for them to work into honey) and get settled in to the summer hum.